Thanks Survival Players will be thankful! I really like the recent work you guys have done, the updates are getting better and better. We are currently in the final stage of testing. Game will be available very soon again. Stay tuned. Will the hours of the downtime gonna be reducted from our premium ? Servers are back online and patch is released! 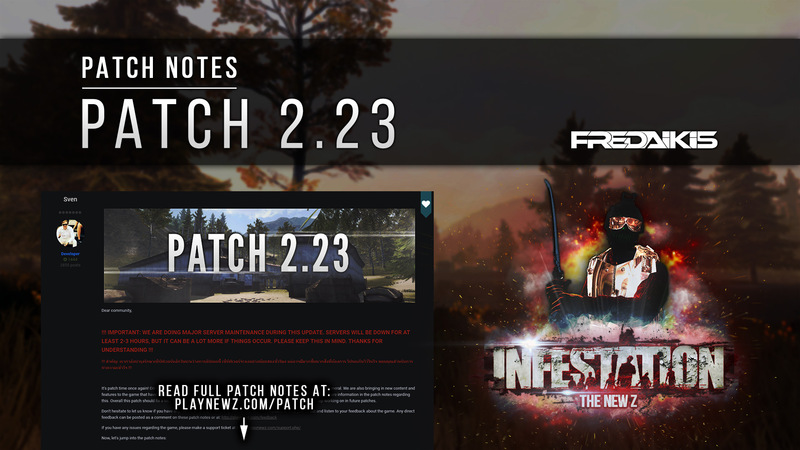 If you have any feedback regarding this patch please leave a comment on the patch notes. Quick note: Servers, moving items, buying items etc might still be a bit slow for the upcoming hours as servers have just been started. Sorry for this inconvenience. We expect everything to be back to normal after tonight. PREMIUM USERS (+ ABOVE) got rewarded with an additional 12 hours due downtime. (downtime was only 8 hours so enjoy some extra hours) Time left on private servers did not get affected by the downtime. I killed BOSS and dropped a task box. After opening the box, it showed that G36's skin task should be like this. Then, when I accepted the task, the game collapsed. Once again, when I log in to play the role of the game, I always pop up the interface that crashes the request. Can you quickly solve this BUG problem? Thank you team for the additional time on our premium for the small downtime, however the content added was well worth the wait! Are you up for a challenge? PVE or PVP player it doesn't matter! We now have "Specialist Contracts"
Why doesn't it matter if the contract is to kill other players? Almost. You first have to GET the actual contract. This has PVE aspects. Also, once a contract is finished, you'll need to farm the coins. A little bit PVE as well. In the end it also opens a market with the coins, contracts, skins, specialist box and of course the new sniper. Enjoy! Thanks for the comment! Reduced the amount of vehicle spawners spawning. Vehicle spawner spawn rate has been adjusted. Should be less common now. Since the XMR is extremely rare we are aiming to do the same with it's ammo. XMR ammo is now spawning in Open World: you can randomly find this ammo (rare), get it from random airdrops or get it by opening tactical weapon cases. How did this change happen? Like 2-3 weeks ago I farmed A LOT of spawners, it's was WAY too easy to get them, but last week I couldn't find a single one. Btw, what happened to normal cars (not spawners) around the map? It's been more than one month since I last find it. To my understanding car's are no longer just sitting around in the open, you can now loot them like a regular item again via normal loot item on the ground. This was also done to help improve performance on the servers. The rate in which they were introduced back to the community was at a very high rate to bring awareness, however that was trimmed down very quickly also having to do with some serious bugs that were found. Now that most of the bugs have been fixed they have returned and also with a normal occurrence in the loot tables from what I have noticed. Not an official statement this is just from my own observation. I have looted three vehicles this week so far and that for me is a pretty good week. Reason: Vehicles / cars are just broken. We aim to adjust them and fix them and then FULLY bring them back. For now they're just a bit less common. About the car spawners: Because they were too common. We just adjusted the spawn rates. Shouldn't be finding those everywhere. Kind of yeah. Read what I wrote above. Thanks for the further feedback!